Come Wednesday 9PM Australian time, Montserratians around the globe will be glued to their favourite device to see if Julius Morris will do it again. 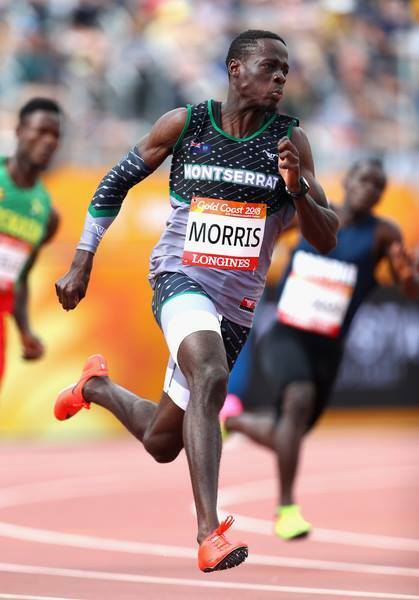 Late Monday evening, local time, Morris cruised into the semi-finals with a 20.67s run in the fourth heat of the 200m men’s race at the Commonwealth Games in Australia. 15-year-old Johmarie Lee, the youngest member of the athletics team clocked 22.43 in the 9th and final 200m heat but did not make the cut to continue. Lee now has an official time in international athletics books. In the Group A of the long jump qualifiers earlier Monday, Darren Morson made a Season Best jump of 7.51m but it was not enough to get him into the finals. He finished in the 17th position. Lavon Allen who was in Group B had a troubling competition. Defaulting on his first jump and not completing the other two. Morris will be running in lane 4 in the third semi-finals heat on Wednesday at 9:06PM Gold Coast time or 7:06AM local time. His personal and season best is 10:28. Coach Scotland said the aim is to make it to the finals as an automatic qualifier if he comes in first or second.